Today in this blog we are going to talk about the best author WordPress themes of 2019 which are stuffed with advanced and latest facilities. All the themes listed on this blog are easy to customize as authors & writers are people who are not familiar with coding or any type of programming skills. This is the reason why we have elaborated the top class themes which offer easy customizations along with responsive layout, WooCommerce support, with other features & facilities. That is not all, you will find the most affordable premium as well as free WordPress themes here. Writer WordPress theme is specially designed for bloggers, authors, and journalists who want to have a website to target global audience and influence them by their writings. This theme has a responsive boxed layout which looks great on mobile, tablets and desktops screens as well. The readers can comfortability go through latest release and books details available on your website from any type of device. 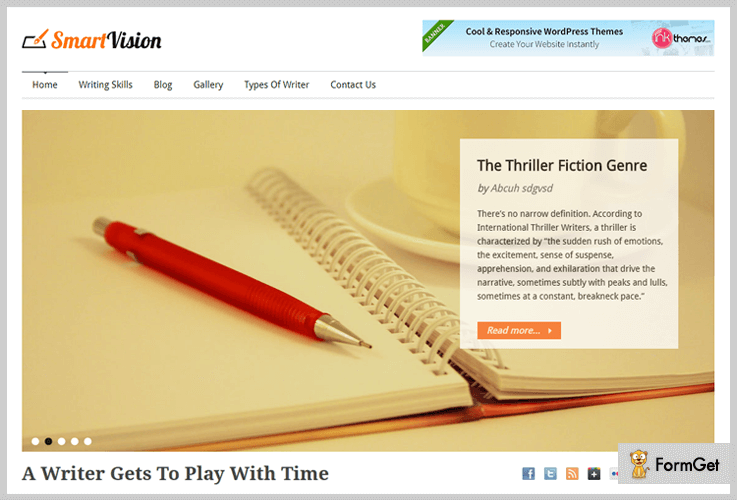 Writer WordPress Theme is priced $79 with which you get demo content, full-time technical support and much more. Attractive ad banner section at the top right corner to showcase offers and deals. Gallery section to display cover pages, author, writers and other images. Widgetized footer and sidebar areas where you can embed videos, display gallery images, recent posts, and more. You get the option to showcase blogs on the homepage and in a separate blog page as well. Boxed slider to project images with title, author name, short description and read more button. This will encourage readers to explore your writings. Graphic novels WordPress theme is very easy to customize as it comes loaded with a powerful theme options panel. You can apply custom colors, text, fonts and other types styling through it. It also has WooCommerce compatibility which is another major benefit of this theme that helps you sell comics, children’s novels and more. You can create shop page, product pages with description about books, and collect payments via PayPal and offline modes. $79 is the cost of this unique and responsive theme. Graphic novels WordPress theme provides you developers license, 24/7 support, lifetime usages access, etc. Three column featured area with hover effects to showcase business services. Dedicated blog section at the homepage which will project the recently published blogs and posts on your website. 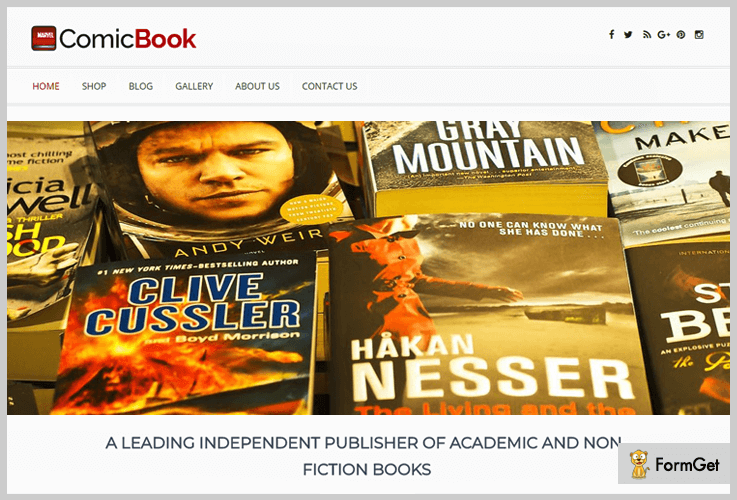 Allows single product page creation with which book details like author info, title, pricing and description can be defined. This theme offers four distinctive slider layouts which will give a unique look to your website. This theme is fully optimized for SEO and helps your website rank high on Google and other search engines. 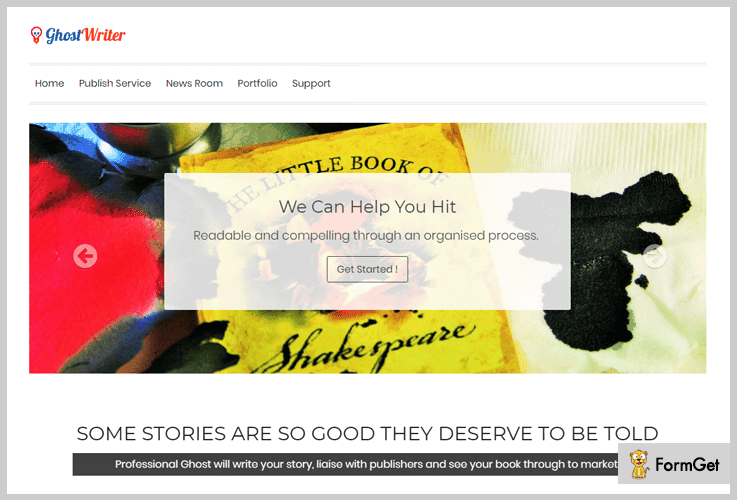 Ghost writing WordPress theme will suit writers who are into horror, mystery and ghostwriting profession. 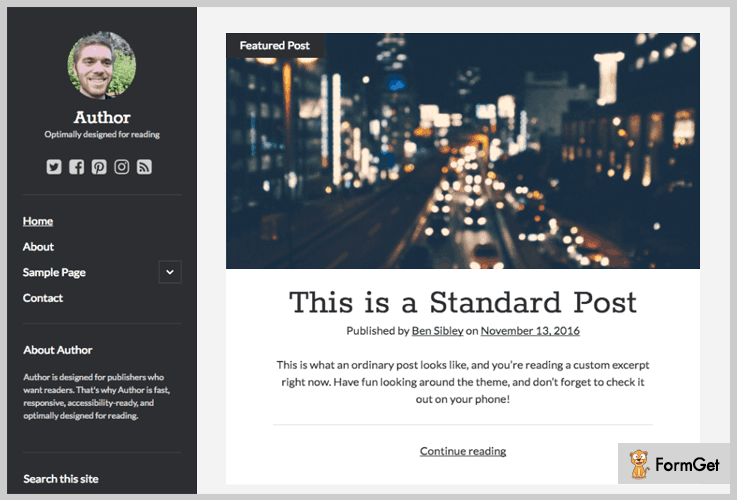 With this theme, writers can post blogs about their writings on the website, display images of the books in the slider section. Plus you also get a special footer section where you can attach widget banner to project ads & deals, share social icons and add user subscription bar for newsletters. Ghost writing WordPress theme charges $79 and it includes facilities like multi-purpose usage, developers license along with free demo content. The theme has got a user-friendly boxed layout which is easy to navigate and fully responsive in design. Multiple widget areas are available on this theme using which you can add a search bar, gallery images, embed videos, recent blogs and more. This theme allows you to create multiple pages and post blogs on your website with ease. In the head section, you can attach custom business logo along with navigation menu. Exclusive tagline space which will grab the attention of visitors on your site. 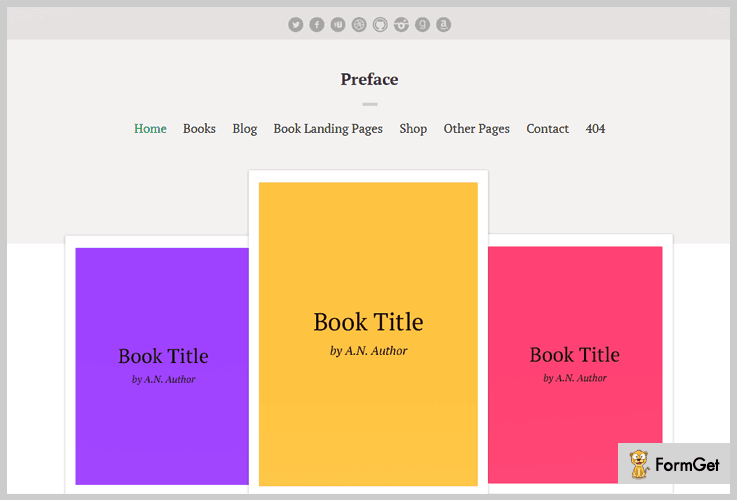 Preface is a well-crafted WordPress theme designed for bloggers, journalist, authors, writers, storytellers and all others who fall under this domain. This minimal theme has lots of customization options that will let you present a unique design for your writer’s website. It comes with tons of features like you can easily change the fonts sizes, fully fluid layout, dynamic book filter and much more. But the notable feature here is you can build an e-commerce website with the help of this theme as its WooCommerce compatible. You can buy this preface WordPress theme at a price tag of $62 with a regular license and 6month support which can further extend to 12 months just by paying $18.75. Landing pages will help you to launch books, storytelling books, magazines will definitely grab the attention of users. For your online selling products, you can create a shop page in the menu panel where you can easily manage your books and display their pricing. Clean and elegant blog section with different formats like standard, gallery, image, link, quote, video, audio to post your tips and ideas. Shortcodes are provided for column, buttons, tabs and even for social icons like facebook, twitter, LinkedIn. Preface template supports feature image for your website with an attractive favicon icon. The author is a text-based WordPress theme definitely made for those who love to write & tell stories. The theme is optimized for speed and designed for reading with its minimalist approach. It has a fluid layout and responsive nature with all screen sizes which comforts users with an ease. The plain and elegant design of theme works great for gaming, business, fashion, music, food, travel, and photography niches. This multi-featured theme is free of cost. Moreover, it also provides you with single click installation and Seo compatible. Enrich your site with RTL compatibility which will display your site in a different way. With this theme, your sidebar will be displayed on left with different page templates, search box, recent posts, categories. Single column area will showcase all your stories and articles in an amazing look. You are provided with a threaded comment section where users can easily share their views. Author template is translation ready with the plugin. Writer WordPress theme is very popular with its 900+ active installations. If you feel to stand out from your competitors with your content than this writer theme is the best option for you. Its a minimalistic and simple design theme that only revolves around your content. You would be amazed at its single column feature where all your content will be displayed in a systematic manner. With its high star rating which is 5 out of 5, you can easily download writers WordPress theme from wordpress.org. It is free of cost. The template is fully translation ready with the help of plugin i.e it can adapt any kind of language. Compatible with all screen sizes like a tablet, mobile, desktop as its responsive in nature. Its SEO compatible which will help you to rank your site on top. 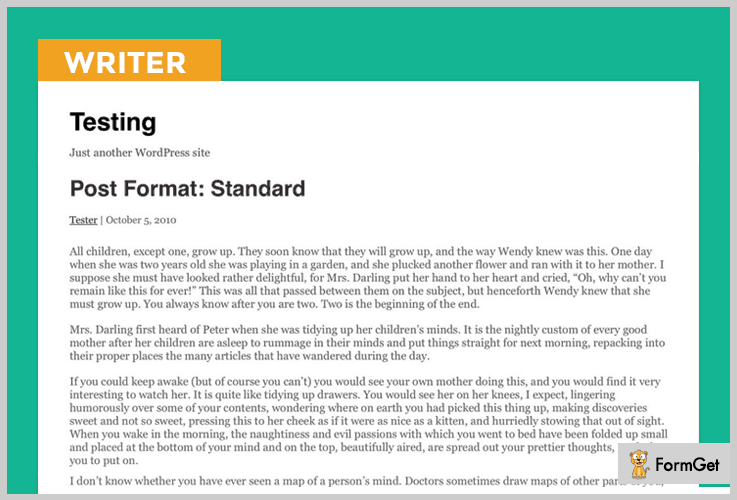 Writer theme is fit with all the cross browsers like safari, opera mini, chrome etc. Time to end this blog as we are at the closure and I hope this blog with surely help you get the best WordPress theme to project your writing on the web through a responsive website. Closure here doesn’t mean that we are done here, you can still be in touch with us through comments. In case you have doubts or queries you can freely share them with us in comments.